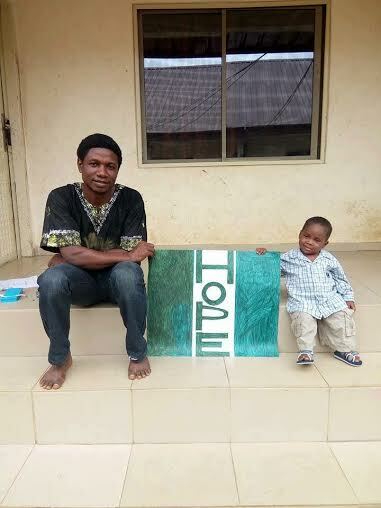 Just over two months ago Hope was living on the streets of Nigeria, riddled with worms, on the brink of starvation and cast out from his community accused of being a 'witch boy'. An image of Danish philanthropist Anja Ringgren Loven giving water to Hope was shared around the world at the end of January. And the little boy's story has since sparked an awareness campaign, led by the African Children's Aid Education and Development Foundation (ACAEDF) which Ms Loven founded with her husband David. Now, new pictures shared by the aid worker, who adopted him, reveal the extraordinary transformation he has undergone in a matter of weeks. In an update on her Facebook page, Ms Loven informed Hope's supporters that the boy was due to undergo corrective surgery to treat hypospadias. Hypospadias is an inborn condition in which one has an incomplete developed urethra. The urethral meatus opens incorrectly. The surgery is expected to take place next week, but "this is an operation the doctors have performed many times, so [he] will be fine", Ms Loven said. "As you can see on the pictures Hope is really enjoying his life now having 35 new brothers and sisters who ALL take such good care of him, play with him, study with him, and make sure he is safe and is getting a lot of love," she added.